LAS VEGAS, NV--(Marketwired - April 17, 2016) - 360Heros Inc., a company specializing in 360 video technology, will debut a line of spherical video solutions utilizing Blackmagic Design cameras at the 2016 NAB Show. The new virtual reality camera systems feature genlocking capability, position cameras and lenses for optimal frame overlap and leverage Blackmagic Design's cinematic quality cameras for professional grade spherical content. 360Heros Inc., a company specializing in 360 video technology, will debut a line of spherical solutions utilizing Blackmagic Design cameras at the 2016 NAB Show. These solutions leverage the professional quality of Blackmagic Design's camera systems to create cinematic 360 video content. 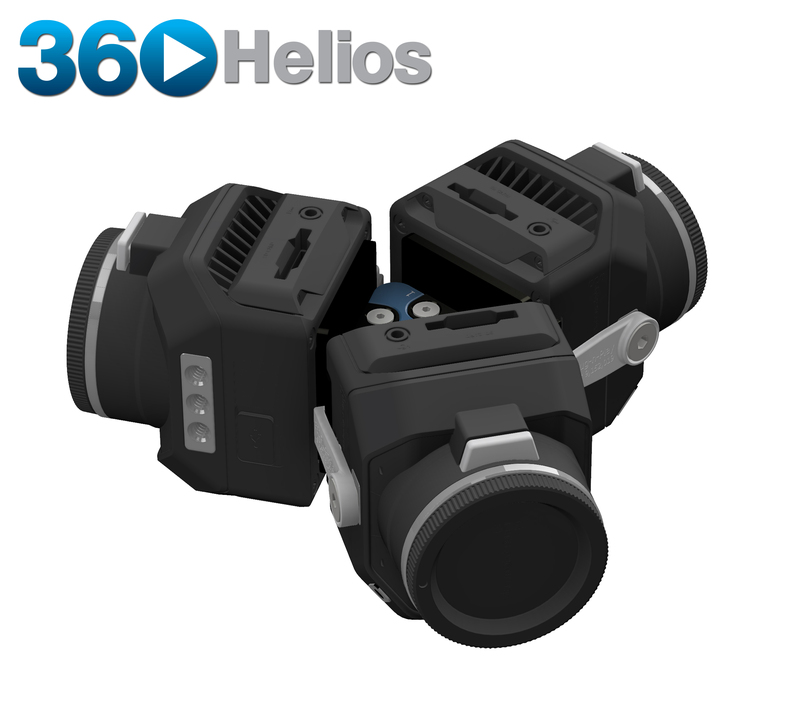 Coined 360 Helios, 360Heros' new products are compatible with both the Blackmagic Micro Cinema Camera and the Blackmagic Micro Studio Camera 4K and are available in three, four, five, six and seven camera arrays. The 360 Plug-n-Play™ design allows users to easily install and remove cameras as well as offering the option to add additional cameras to achieve greater frame overlap and resolutions. "Creating professional and cinematic 360 video content is not only a reality, but it's also an in-demand medium, and delivering on it starts with investing in the right technology," said Dan May, President, Blackmagic Design. "360Heros is answering the call for high quality 360 rigs with essential features, such as remote control and syncing, and we are thrilled that Blackmagic Design's Micro Cinema Cameras and Micro Studio Camera 4Ks are a part of that, helping to capture and deliver cinematic 360 video." "In creating 360 video systems, syncing cameras has been a huge challenge," noted 360Heros CEO Michael Kintner. "With Blackmagic Design technology, we're answering content creators' demand for higher quality spherical content and genlocked remote controlled solutions," he added. "This year's virtual reality head mounted display (HMD) releases, and the growth of YouTube and Facebook's 360 video platforms have led to massive demand for professional content creation tools." "Our goal with this new product line is to support content creators and we're proud to partner with a manufacturer like Blackmagic Design to create these solutions," Mr. Kintner said. 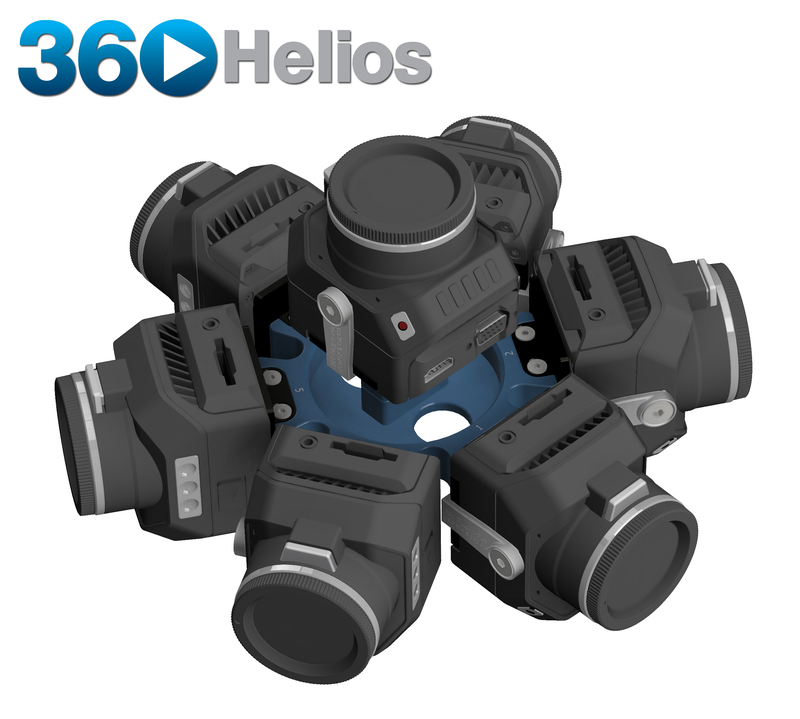 The 360 Helios rigs feature a new version of the Bullet360 control board system already being utilized in the 360Abyss. Coupled with Blackmagic Design's Mini Converter Sync Generator for genlocking, these boards have the ability to control and sync an unlimited number of Blackmagic Micro Cinema Cameras and Blackmagic Micro Studio Camera 4Ks. With the Bullet360 control boards, producers can remotely operate all cameras in sync via the cameras' expansion ports. The 360 Helios systems are capable of outputting 4K (4,000 x 2,000 pixels) resolution content for virtual reality HMDs and can create content upwards of 6K (6,000 x 3,000 pixels) depending upon different lens and camera arrays. These new systems will be on display at 360Heros booth N8619 and B&H Photo booth C11016 at the NAB show in Las Vegas, NV, and will be available for pre-order in early May. 360Heros Inc., a company specializing in virtual reality 360 video technology, creates camera systems that capture 12K resolution spherical VR content. 360Heros also develops 360 video workflow solutions such as 360CamMan, the world's first VR media management software. Through years of research and innovation, 360Heros is empowering content creators to push the limits of this emerging technology and our ability to create immersive content. 360Heros, Inc. is not an affiliate of GOPRO® or Woodman Labs, Inc. 360Heros is a very proud user of GOPRO® cameras. About this company 360Heros Inc.